The children were beaming with happiness when the Princess was photographed with them. It was such an honor to have the Crown Princess as an official visitor at the School For Life. The Crown Princess of Thailand came! 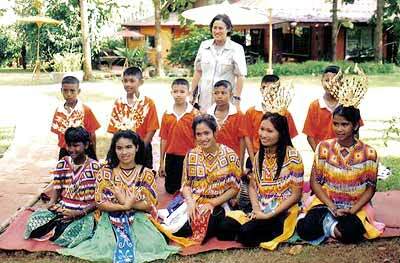 For the children of the School for Life on the farm in the royal forest near Doi Saket, it was like a dream come true. But before the great day, workers were summonsed to fix and improve the roads, having been weakened by the rainy period, on which the Princess was to pass on her tour of the farm. The School for Life team had decorated the farm in a festive manner, and several activity stations were prepared for the Princess and the children. The official party arrived in a convoy, the officials saluted, flowers were exchanged, and then the Princess, surrounded by TV crews and photographers, walked towards the farm house where she was greeted by Professor Dr. Juergen Zimmer. When she returned, she received several beautifully wrapped presents from Thaneen ‘Joy’ Worrawittayakun, the head of the family department and ‘Surrogate Supermum’ (Bangkok Post), Yothin Sommanonont, head of the educational department and also several others. The Princess also signed her name on an official record of the day – now framed – and in the guestbook. The drumming group of nine boys, the “Exotic Heritage Drum of Victory”, gave their all, just like at the international contest where they took first place a few weeks ago. Children drew pictures to the music from Beethoven’s Sixth, depicting what they felt. The Princess was especially interested in therapeutic effects of this on background trauma. The Princess was treated to music and singing from the Lanna-orchestra in the atrium. She climbed the stairs to the big house and entered a recording studio specially created for a Lanna-Jazz-Pop-music project; there she met a dozen German musicians and sound technicians who came from Germany to create a CD with the children. The princess was also treated to a blues song sung by Kai Wingenfelder of ‘Fury in the Slaughterhouse’ and also talked to him about her father’s love for blues. She watched as the children from the hotel management team showed her how to perfectly make a bed in one of the bungalows. The ‘cat-children’ performed a scene from ‘Cats’ and were photographed with the Princess. In the roofed station for natural medical and food products, the children were cutting roots and the Princess was very impressed that all the products were planted more than twenty years ago in her father’s forest. Girls from the tsunami stricken area from the south of Thailand, who stay as guests, performed, together with their own band, an oriental themed dance, and were beaming with happiness when the Princess photographed them. The children from the restaurant team set up an open air kitchen beneath a group of trees. The Princess put on a white apron and a chef’s hat and prepared a beautifully decorated meal with the children, and auctioned off the dish. Her Royal Highness stayed at the school an hour longer than deemed by protocol. She took photographs and made notes during her visit. She was then bade farewell by the children in song. 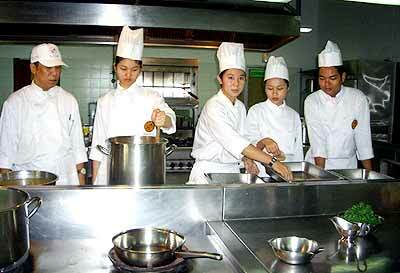 I-TIM, the International Hotel and Tourism School, Bangkok, is now accepting applications for the January 2006 intake. All nationalities are welcome, with minimum entry level M.6 or high school. I-TIM offers a two year diploma program and a one year certificate. The first year includes five months internships in Thailand including Chiang Mai, with salaried overseas internships available in the second year of the diploma program. For further information visit www.i-tim.ac.th e-mail [email protected] or telephone 0 2732 0170. 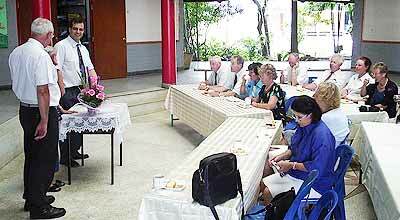 A group of 19 professors from the Institute of Geography within the Faculty of Education at the University of Erlangen-Nrnberg, Germany, paid a visit to the Christian German School Chiang Mai (CDSC. The group of professors, accompanied by their spouses, were welcomed by the school principal Matthias Wolf. The target of the overall excursion of the German Association of Geography was physical geography, town planning, botanical issues and educational themes. A great interest was shown in the functioning of German schools abroad. After their arrival at the CDSC the group of professors were welcomed by the school principal Matthias Wolf. Afterwards they were shown around the school in groups with the possibility to participate in different subjects. Many questions were asked and a special interest was shown in the structure of the school as well as the teaching methods at CDSC. Pornchai Jitnavasathien, Chiang Mai deputy mayor announcing Muen San Community Silverware Fair. Muen San Community Silverware Fair will be held on October 22 at Wua Lai Road, Meng Rai section, from 6.30 p.m. onwards, organized by Muang Chiang Mai in association with Chiang Mai municipality. Pornchai Jitnavasathien, Chiang Mai deputy mayor, said that this fair is to promote silverware and to help pass on the skills of the Baan Wua Lai villagers to the younger people, as 200 youths have been trained in the making of silverware and their works will be displayed at the fair. There will be a silverware and aluminum artwork competition, a silverware product display, and performances on stage. The Faculty of Engineering will host the 24th Gear Games at Chiang Mai University October 20-22. Gear Games is a gathering of engineering students from 30 universities in Thailand, with more than 3,000 representatives due to participate on this occasion. Asst. Prof. Dr. Sermgriat Jomjanyong, dean of the faculty of engineering, and Dr. Auttapon Samuttakoop, associate dean for student development affairs, at the press conference to announce the 24th Gear Games. On October 14, Asst. Prof. Dr. Sermgriat Jomjanyong, dean of the faculty of engineering, and Dr. Auttapon Samuttakoop, associate dean for student development affairs, presided over a press conference to outline the arrangements for the games. Gear Games has been held for 31 years. The first games were hosted by Kasetsart University in 1974 and this year is the sixth time for Chiang Mai University. Due to its pleasant weather and magnificent scenery, Chiang Mai attracts many people every time it is the host. In Gear Games, students compete in 12 sports, including football, basketball, tennis, softball, rugby, and athletics. Beside sports, the usual overdone beauty pageants will be held, called Miss Gear Contest, held for the first time this year, and with contestants from all 30 universities. 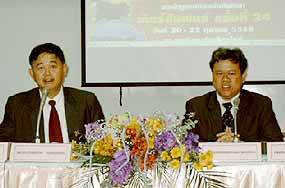 All competitions, as well as residences for competitors, will be in Chiang Mai University. Shanghai comes to Chiang Mai on October 29 as La Luna Gallery will be invaded by concubines, sing song girls and courtesans. These sensual and exotic Asian women with seductive expressions, confident movements and colorful dresses are all creations of Bangkok-based artist Christian Develter, who found inspiration in Shanghai for his new solo exhibition. “Blue Courtesan”, 130 x 170 cm, acrylic on canvas, by Christian Develter. “I am fascinated by 1930’s Shanghai as well as the emerging urban China today. This exhibition is a tribute to the timeless elegance and power of the daughters of the Dragon,” he says. Christian Develter has made La Luna in Chiang Mai his main gallery since it opened last year. 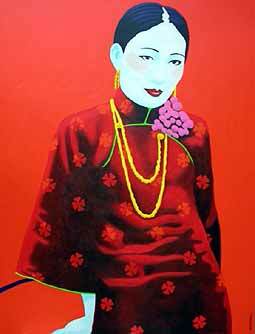 He gets his inspiration from impressions and experiences in Asia, and each canvas is a visual feast of color and life – pop art with an Asian twist. Originating from Belgium, Christian Develter utilizes traditional painting techniques used by the Flemish masters but in new, daring and innovative ways. For further information please contact Sommai Lumdual, director, La Luna Gallery 190 Charoenrajd Rd., Chiang Mai, (ph: 09 635 7667). The solo exhibition will run from October 29 - November 27, open daily 10 a.m. - 8 p.m.
An exhibition entitled Mini Sculpture and displaying the works of lecturers and students on the sculpture course is being held by the Faculty of Fine Arts at Chiang Mai University from now until October 30, at the Chiang Mai City Arts and Cultural Center. Assoc. 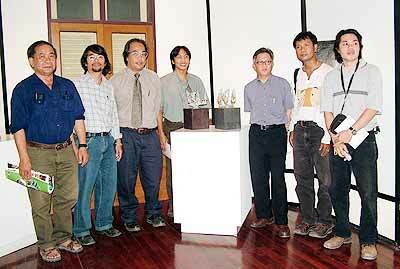 Prof. ML Surasawat Sooksawat, the dean of Chiang Mai University (3rd right) views the exhibition together with lecturers of Faculty of Fine Arts, Chiang Mai University. Altogether 30 student works are being presented to the public. This will help them gain confidence as they move towards graduation, and it will also help to propel the field of sculpture into new directions, as the works are very much a reflection of the creativity of the young artists. For more information please ask at the counter service or call 0 5321 9833 from Tuesday to Sunday during 8.30 a.m. to 5 p.m. Adult tickets are 20 baht and 10 baht for children while for the usual myriad of smokescreen reasons, 90 baht is being charged for foreign adults and 40 for foreign children. Obviously foreigners will get an extra 450 percent of enjoyment from the display. That should be enough to have tourists flocking in. The official opening ceremony took place on October 11 presided over by Assoc. 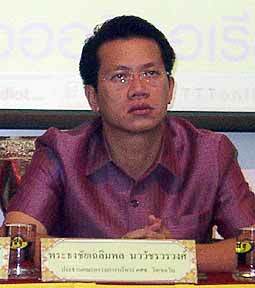 Prof. ML Surasawat Sooksawat, the dean of Chiang Mai University. Although the deadline for free entries on northern Thailand’s first Chiang Rai Classic Car Weekend has just passed on October 19, there may still be time left for a few late entries. Owners of classic cars like this Rolls Royce will meet up on November 11-13th. Count Gerald van der Straten Ponthoz of Belgium is host and Ovidias Belgian Chocolate part-sponsors the event, which starts from the Mandarin Oriental Dhara Dhevi Resort, Chiangmai, at 9.30 a.m. Hosts of the weekend extraordinaire, Count Gerald and Khun Weerapong Boonklieng in front of their home, Insii Thai House, admiring a 1969 Rolls-Royce Corniche convertible. First overnight stop is at Count Gerald’s home, Insii Thai House, Mae Chan, and the finish is a presentation dinner at The Legend Resort and Spa, Chiang Rai. The weekend will also feature a car show and exhibition of racing team VDS of Belgium and USA. The Chulabhorn Foundation has prepared a musical and cultural performance entitled “Two Kingdom Relationship” to celebrate the 72nd birthday of Her Majesty Queen Sirikit and the 30 year anniversary of full diplomatic relationship between Thailand and China. The event will feature musicians from both countries. A highlight will be a performance by Her Royal Highness Princess Chulabhorn on a Chinese musical instrument called a “gu zheng” with a Royal Thai Navy band accompaniment. It will be on October 29 at Chiang Mai University convention hall, and proceeds will go towards cancer research.